Rick Sterling is an investigative journalist based in the San Francisco Bay Area and member of the Syria Solidarity Movement. He has supported struggles against imperialism and for justice in Africa, Latin America, and the Middle East since the early 70’s. On April 14, the U.S. and the UK, with France as their junior partner, fired over 100 cruise and air-to-surface missiles into a sovereign state. Trump tweeted, ‘Mission Accomplished!’ What’s your take on it, Rick? Well, the first big travesty here is that the U.S., the UK, and France bombed Syria hours before the OPCW (Organization for the Prohibition of Chemical Weapons) inspectors arrived on the scene in Douma to determine whether chemical weapons had been used. In other words, they came to a verdict before the investigation. They were in a hurry to bomb. Possibly, the aim of the strikes was to prevent the OPCW inspector’s fact-finding mission. Definitely! It’s a clear sign of political bias when accusers cannot wait for the investigation and the verdict before to execute the punishment. We saw that also with the Skripal case. The incident happened on March 4, and on March 5, British PM Theresa May and Foreign Secretary Boris Johnson were already saying that Russia was most likely involved, and they were talking about punishment. In both cases, we saw this pattern of big accusations before any investigation had even begun. Russia and Syria have been pushing for an investigation from the start, but Western officials led the UN Security Council to reject the Russian proposal. So far the OPCW inspectors haven’t even been able to confirm whether the April 7 chemical attack ever happened. Yet the missiles were launched in response to such attack. It’s completely illogical. And there’s another aspect to this. The UNDSS (UN Department of Safety and Security) was delaying the arrival of the OPCW inspectors because of safety concerns. Yet in the West, it was strongly asserted and repeated over and over that the Russians and Syrians were preventing the OPCW inspectors from gaining access to Douma. They went even further. U.S. State Department said that the Russians and Syrians were busy sanitizing the scene of the crime and removing incriminating evidence. So, all sorts of allegations based on no, or extremely little, verifiable evidence. The Western media coverage of the Douma incident relies solely on footage provided by the White Helmets, a group that operates solely in terrorist-held territories and is funded by the U.S., the UK, and other western governments. As for the Skripal case, the British press run a story based on Boris Karpichkov’s allegations. The self-styled ex-KGB major claims he was warned about a plot to poison Sergei Skripal in a threatening phone call. This story appeared in the Daily Mail a few days ago. The Daily Mail is a sensationalist tabloid, and Karpichkov openly says that he wants the Home Secretary to provide for him and his family. He’s making no disguise of his monetary goals. Moreover, in the story, they acknowledge that there’s no way that anybody will be brought before a court in this matter. This is another example of a wild accusation that fuels a certain mood, a certain intention, without any chances of verifying whether is true or false or half true or totally bogus. It looks like more sensational, fake news. The public knows pretty much nothing about the lot of the Skripals. Anyway, we’re told that thanks to Karpichkov’s cooperation, British counter-terror police have identified a Russian hitman who has already flown back home, hence they might never get the chance to question him. Before there has been any investigation, they already know who the assassin is. Karpichkov claims they’ve known each other since the early 90’s. He thinks the Russian secret service is up to murder him as well. What we got here is a spectacular movie script! People on a hit list, a ruthless assassin, and a KGB defector living under a new identity with a British passport fearing for his own life. And by the way, can the Home Secretary provide him a trip to the U.S., a nice car, and a house for the rest of his life? It looks like there’s no shortage of stories that reveal a Russian trace and consequently harm Russian interests. When I think back over the last couple of years, I notice there’s a pattern. A pattern involving chemicals, actually. There’s kind of a chemicals’ tent to all of these accusations. First, the accusations are made. Then, there’s no investigation, but Russia and Syria are bound to be guilty. It’s part of the information war in the contest of geopolitical tensions going on in the world. Just for the record, would you give us a quick recap of the key events in this pattern? In 2016, the allegations of state-sponsored doping in Russia. That was the case when the McLaren Report came out. That relied on the testimony of the former director of Russia’s Anti-Doping Center Grigory Rodchenkov. Correct. They didn’t allow the Russians to respond to it, they didn’t provide any evidence, but the accusations were there. Then, we had the South Korean Winter Olympics. The IOC (International Olympic Committee) had given Russian athletes a blanket ban from competing following a seemingly politically motivated doping scandal. Just days before the start of the games, the CAS (Court of Arbitration for Sport) cleared of charges 28 athletes. Right. But at the very end of the games, Russian curler Alexander Krushelnitsky tested positive for meldonium (a substance used to treat heart attack victims, prohibited since 2016), and bobsledder Nadezhda Sergeeva tested positive for trimetazidine (a medication used for angina, banned because of its effects on metabolism). Very suspicious. Why would they do it? There’s no advantage. The curlers were laughing at the idea of doping for curling. Why do you have to sweep too hard? Do you need to build up your strength for sweeping for twenty seconds? It makes no sense. On March 4, we had the Skripal case. Once again it’s about chemicals. The UK government blames Russia for the poisoning of the Skripals with the Soviet-designed nerve agent Novichok. It doesn’t make any sense. If the Russians wanted to assassinate somebody who they considered to be a traitor, why would they use a chemical that’s associated with Russia? And most recently, the incident inDouma. The Syrian government, which is advancing in the conflict there with Russian support, is successfully negotiating the departure of the jihadists and the majority of civilians have rushed in the government-controlled areas. Why would president Assad carry out a chemical attack that kills scores of children and women? It makes no sense at all. In all these cases, the Western media parroted allegations with no questioning of the official narrative. Western media jumped on all these cases. They broadcast the accusations with a lot of certainties before there’s been any serious investigation. It’s a travesty of due process, legal proceedings, and international law. It’s really a very negative trend. I recently wrote an article projecting what would happen if Rodchenkov were assassinated. They’ve already set the stage here in the U.S. claiming he fears for his life. Of course, it’s nonsense. He’s already done as much damage as he could to Russian sport. In your opinion, the American public is aware of the huge impact the MSM have on society in shaping opinions and behaviors? Let’s hope the public in the U.S. and the West is more intelligent than they give us credit for. Of course, most people believe it when it’s broadcast all over the media, but I do sense that there is a strong, and maybe growing, skepticism above some of the accusations. I see signs of that in the comments to the posts, in talking with people on the street, and attending events. It’s the establishment in conjunction with the MSM who are pushing the tensions. It’s not that persuasive when you get right down to it. On his campaign trail, Trump proposed a sweeping redirection of America’s global role and focused heavily on domestic issues. Apparently, he can’t carry out his political program. Very much so. Even before he was inaugurated, the foreign policy establishment was sounding the alarms that the U.S. global leadership was being questioned. U.S. foreign policy is run by more than the president, and it doesn’t matter what he won the election on. They want to keep escalating tensions. The one and only time when Trump has received praise from the Washington consensus and the MSM was when he bombed Syria last year. Before he was president, in a number of tweets, which are recirculating online, he argued that the U.S. ‘should stay the hell out of Syria’. It looks like it’s increasingly difficult for Trump to bring the boys home. Right. On April 4, 2017, a chemical attack killed scores of people in the Syrian town of Khan Shaykhun. Just the preceding week, the Trump administration had stated that the removal of President Assad was no longer a priority. So, perhaps Assad could stay. But the incident happened. The U.S. State Department rushed to blame Assad despite the investigators didn’t even visit the site and the only soil samples were provided by the terrorist group controlling the area. There was a reversal back to the previous Assad-must-go policy. 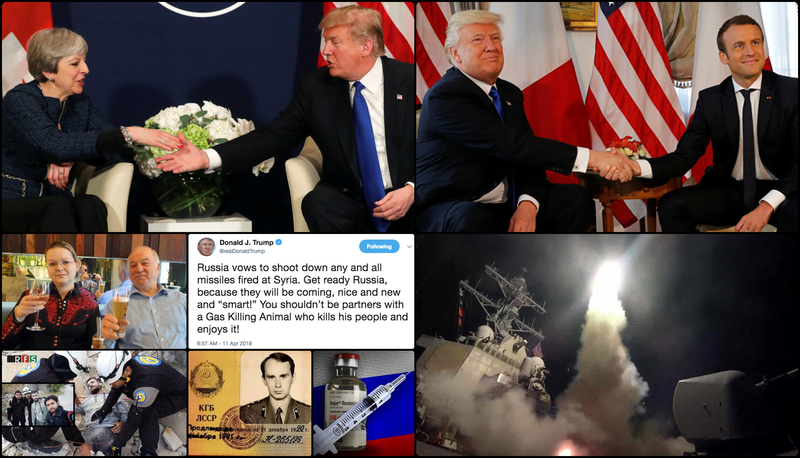 On April 7, the U.S. launched 59 Tomahawk cruise missiles into Syria. The same thing this year. On March 29, Trump said, ‘We’ll be coming out of Syria like very soon.‘ The next week, the incident occurred in Douma, and a reversal of the policy ensued. 71 out of 103 ‘nice and new and smart’ missiles were shot down by Syria’s Air Defense Force, which consists of means made in the USSR over 30 years ago. Trump had tweeted, ‘Get ready Russia’, but none of the missiles entered the area of responsibility of the Russian air defenses. Apparently, there was some kind of back-channel communication with Russia to make sure they knew the attack was gonna be very restrained and targeted. Of course, the Pentagon claimed they successfully hit chemical weapons storage facilities, but the very OPCW confirmed that all of the chemical weapons in Syria were removed in 2014. So, that was just for public consumption, really. Nearly two years into the Russiagate scandal, the Mueller investigation dominates headlines, the DNC files a lawsuit over conspiracy, midterm elections approach, the Justice Department investigates the president’s personal attorney, Stormy Daniels graces the cover of every American magazine and assures the readership she ‘can describe his junk perfectly’. A missile attack on a foreign country may work pretty well to divert attention from news coverage of the troubles swirling around him at home. Trump put his foot in it with his tweets and accusations. I think he realized that it was a mistake, but he had to do something for his personal position, for all of the personal attacks he’s undergoing. That said, the U.S. foreign policy establishment is demanding that the troops stay in Syria. They are very clear on that. And by the way, there are 20 major newspapers in the U.S., and after the attack, zero of them complained about it. Do you believe impeachment is looming large? It’s hard to say whether there’s anything in the Mueller investigation that’s gonna come up at the end of the day. It’s clear that they are kind of grasping at straws. And even this DNC lawsuit charging collusion between Russia, Trump campaign, and WikiLeaks, seems a bit ridiculous. Maybe, it’s just to keep the issue going as the Mueller investigation seems to be finding very little concrete. Trump will not be impeached now because he’s got a Republican majority. I don’t think they will allow it, even though there are Republican senators who fiercely oppose Trump’s foreign policy peace inclination, and they are the worst war hawks. Lindsey Graham, John McCain, and that gang, they never oppose a war. Indeed, it’s a dangerous situation right now.